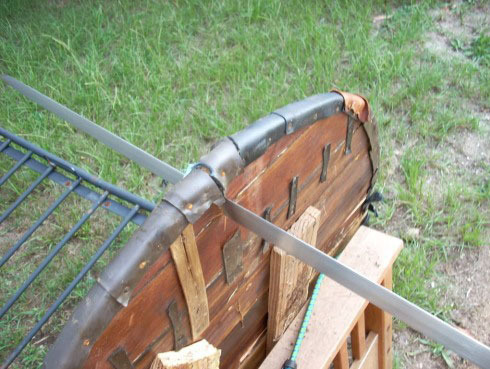 Getting a solidly built Scottish Claymore for under $300 is not an easy task..
As they are such BIG swords, there are so many more things that can go wrong either in the steel of the blade itself or under the hilt that many so called 'functiona' Claymores are actually extremely dangerous! But maybe, just maybe, this rather inexpensive Scottish Claymore by the Hanwei forge can deliver the goods.. So let's take a look and see.. 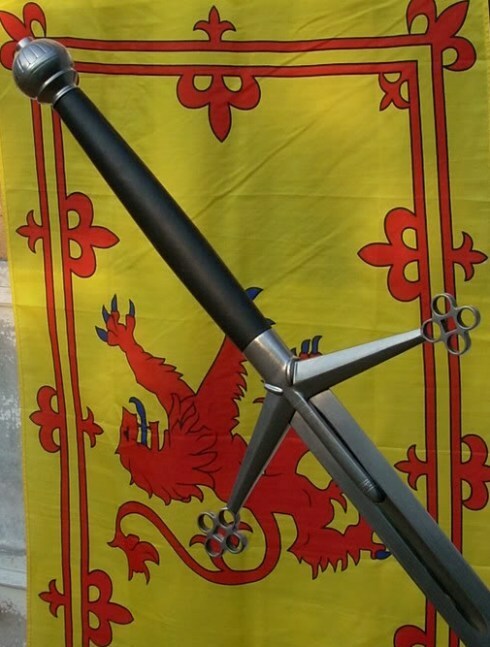 I've always had a love of the Scottish claymore, as long as I can recall. All the arguments to the contrary, the big 2 handed highland sword defines claymore to me. I have a basket hilt claymore, and to me it’s just a basket hilt, not a claymore. OK my prejudice is now established. In spite of said love, it took quite a while to buy mine. One was the cost, most were well in excess of 300.00 several years ago. Second was finding one that I liked. 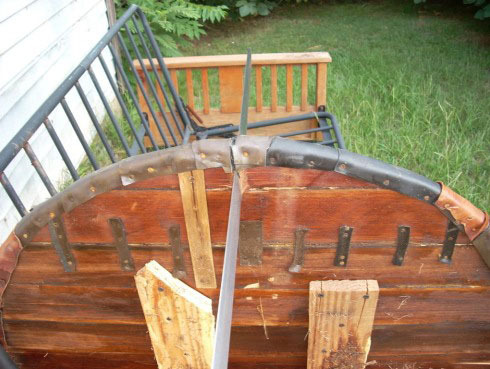 I looked at several Windlass models over the years, and always found something that turned me off in the particular sword. The "standard" models I tried had hit or miss assembly, didn't care for the brass hilted ones much, nor the twisted hilt models. Anyway, in the end I decided on this one. When unpacked I was extremely surprised at the overall construction of the piece. 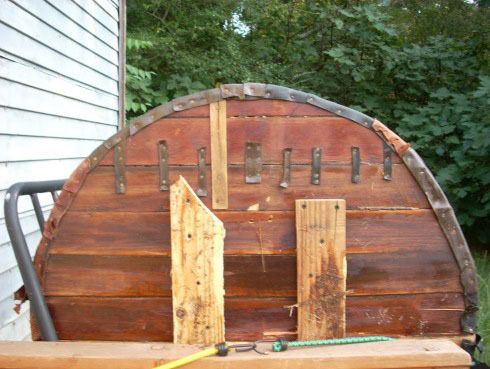 It was superior to any of the Windlass versions I had handled in the past, all fittings very tight and solid, and no play at all. 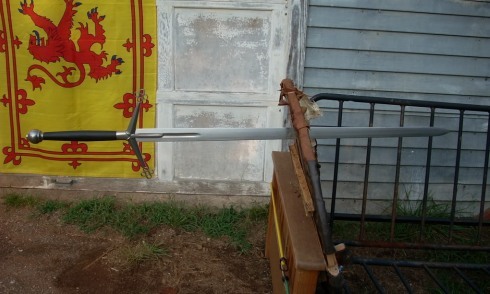 Aesthetically, it is pretty close to basic as it can get and be called a "traditional" 2-handed Scottish Claymore. The fittings are mild steel, the black grip leather wrapped over a central core. There is some decorative scalloping on the globe shaped pommel and some etching of the one piece guard, on the part that acts as langets. The quatrefoils are neatly done, and I truly like the way the manufacturer opted to reinforce the guard with, for lack of the proper term, raised buttresses (quillion block?) where the arms meet the hilt body. 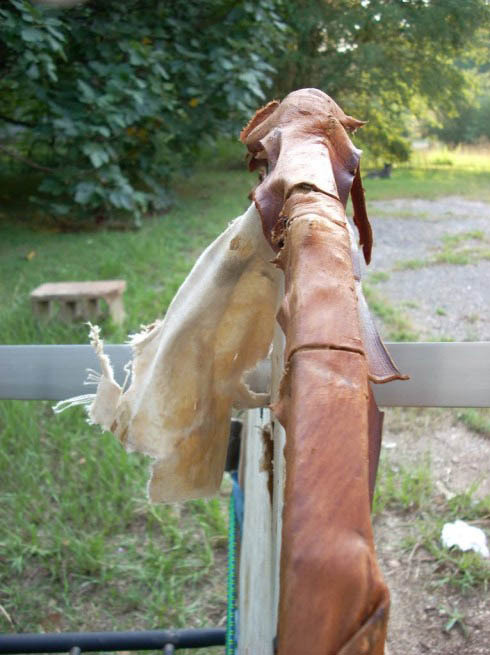 The leather covering is the same as that used in the "practical" series (which is how this piece was marketed by the vendor) and is well constructed and attached. The blade is well made and exhibited no marring at all when received. The one MINOR criticism I have regarding construction involved the peenings, of which the blade has two (the tang peened to the pommel, and the blade drilled and peened to the hilt at the langets). Both could have been ground and sanded a bit neater, as both exhibited rough edges. Nothing major and certainly easily rectified, but it is a minor quality control issue. What truly matters are those both were tight (and still are). Overall length: Listed as 55" long, mine is 55 1/2"
Blade length: Listed as 41", mine is 41" also, 36 3/4" to the end of the langets. 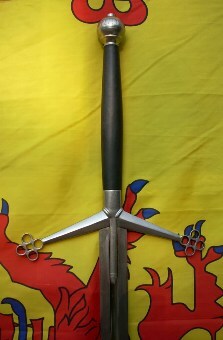 The langets fill about half of a shallow fuller in the blade; the fuller extends an additional 5" below the end of the langets. Blade width: 1 15/16" at the hilt tapering slightly to 1 1/4" at 39" then dramatically to a rounded point. C.O.P. : approximately 23", anywhere between 19-27 was very little vibration. Weight: Somewhere between 5 and 6 lbs. Sorry I can’t be more exact, my scale is still missing and I keep forgetting to get a new one. And they'd probably look at me funny if I took it to the hospital where I work to weigh it. Quatrefoils are 1 13/16's in diameter and uniform. Hilt width ia 12 1/16", length is 1 1/8" tapering outward to 3/8" at the quatrefoils, thickness tapers from 3/4" to 3/8" . The hilt continues an additional 1 1/2" past the quillion blocks. Grip: Black leather covered (unsure of base material, never been disassembled). Oval shaped, 4 1/2" circumference at the widest point, 9 1/8" in length, not counting the extension of the guard, it easily accomodates a two handed grip, with ample room for variation of grip styles. The pommel, as earlier stated, is globe shaped, and 6 3/16" in circumference. Back to the old shield target for this one. It still had one more test in it, but after this one its looking grim for the auld girl. I felt like I had to set the appropriate tone for this test, so you'll have to excuse the Scottish standard, it's me heritage coming to the fore methinks. 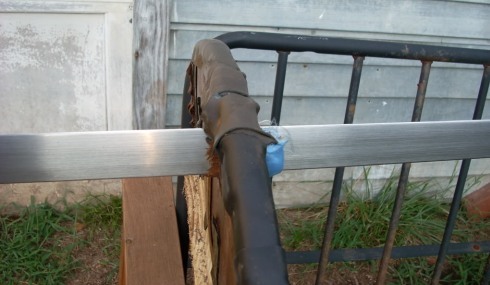 Well, using a Scottish claymore doesn't require a lot of finesse, so this is straight forward hackfest. 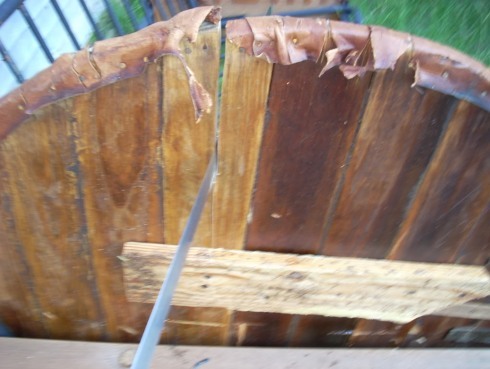 First the shield was attacked against the wood grain, carving out nice hunks of wood and collapsing the planks. Then I moved on to attacks with the grain of the wood. The pics pretty much sum up the result. The sword cleaned up really well afterwards, a quick spray with breakfree, a wipe, and all that was left as a reminder of the session were a few very light scratches. I am very pleased with this piece, and I think my ancestors would have been quite happy to have one like this to butcher a few Sassnach (or each other :P). I think it captures the spirit of a claymore very well. It's a fine piece, imposing and very workman-like. Its by no means the prettiest I've ever seen or handled, its definitely "plain Jane", but hey, always remember the k.i.s.s. principle. Hanwei got this one right! The price for the Hanwei Scottish Claymore is typically somewhere slightly above or below the US$300 price point (though can be as much as the MSRP of $370). However we like them so much we are proud to offer them for just $249.99. Check out our selected range of Hanwei Medieval Swords at the SBG Sword Store HERE!